« Media Watch Dog Foaming at the Mouth! Tom Brokaw’s big Baby Boom show is on CNBC tonight. Two hours! Marketing blitz includes a Brokaw interview featured on the front page/Calendar section of today’s L.A. Times. Brokaw, who is 70, says he has “shifted gears,” after leaving his 44-year career at NBC, and that he’s found the right mix of work and pleasure. “At some time in the future, I’ll probably shift again,” quoted the Times, remarking that he doesn’t see himself sitting on the porch, rocking the day away. 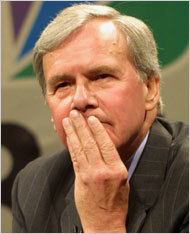 I highly respect Tom Brokaw. Love his comment: Retire from what,Life?